During the past couple of years I’ve begun to recycle old and worn books. Sometimes I make an old book into a book I’ve written. I paint the cover and tear out unwanted pages, then insert pages with my words and illustrations. Sometimes I fold, cut, or glue pages to form a work of art. Some people call this medium Upscaled Books or Altered Books. 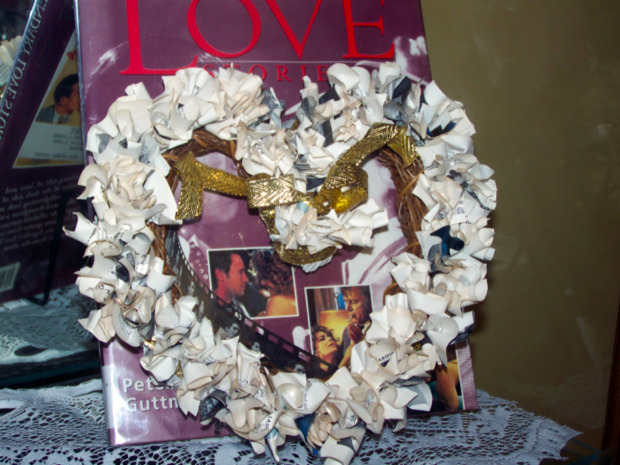 I made the small wreath from an old encyclopedia with gold-edged pages. 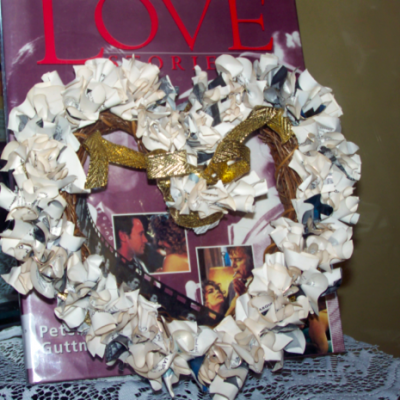 I cut pages in half, bunched them together and hot-glued them to a heart shaped grapevine wreath. Then I added a gold ribbon. 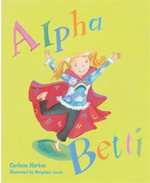 I’ve conducted a few workshops for libraries and book clubs. 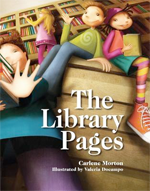 I’ve been asked to do a program for the local library this summer during their Adult Summer Reading Program. Their theme is “Between the Covers.” Any ideas? Nothing X-rated, please.